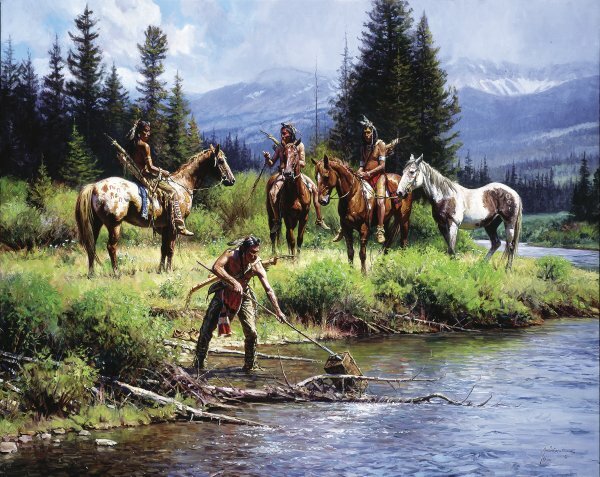 "The River's Gift" was painted for the Coeur d'Alene Auction in 2007. As with many Grelle paintings, it has strong narrative in addition to rich, vibrant color. Indeed, what is the gift that the river has given to these braves? And how many times through the years have such gifts been given to unsuspecting recipients? This strongbox looks like it may contain a white man's fortune, but of what use to the braves out in the middle of an untamed West?